CHANDIGARH, Jan 12  An empty school bus and a Chandigarh Transport Undertaking us collided with each other this morning. CHANDIGARH, Jan 12  Civil Judge (Junior division) Vani Gopal Sharma today issued notice to the UT Administration for January 16 on a PIL filed by a lawyer praying for a directive to the authorities to build Governor's Palace. CHANDIGARH, Jan 12  All banking activity remained paralysed today in the city following a nationwide strike by members of various unions. Competition Master contests CHANDIGARH, Jan 12  The second phase of the Competition Master library related competitions 98 will be held from January 14 onwards. CHANDIGARH, Jan 12  Students of Government College for Men, Sector 11, today went on strike in protest against the arrest of the president of the college union last night. CHANDIGARH, Jan 12  The fifth Signal Battalion of the Central Reserve Police Force celebrated its raising day at its unit headquarters at Mohali today. CHANDIGARH, Jan 12  The Panchnad research Institute will send a five-member delegation to South Gujarat where clashes between Christians and Hindu tribals allegedly took place. CHANDIGARH, Jan 12  The Chandigarh Administration has revised the rates of cash handling allowance admissible to clerks and assistants of the UT Administration with effect from September 1,1997, in view of the implementation of the pay commission report. CHANDIGARH, Jan 12  Government College for Men, Sector 11, won the running shield in an inter- college declamation contest organised by DAV College here today. CHANDIGARH, Jan 12  An empty school bus and a Chandigarh Transport Undertaking (CTU) bus collided with each other this morning. As result of the crash, the yellow-coloured traffic light pole and a couple of street lights poles on the road dividing Sectors 20 and 30 were smashed. The movement of traffic was hampered seriously for over two hours. No one was injured in the crash. A case has not been registered as both the bus drivers reached a compromise, police officials confirmed in the evening. Though the traffic police arrived at the scene to divert traffic, the problem of jurisdiction of police stations delayed the clearance of the road much to the chagrin of office-goers during the peak hour. The Industrial Area police arrived first and said that the area of occurrence was under the Sector 19 police station and preferred to call their counterparts from Sector 19 before starting the legal process. Bystanders who were delayed due to the blockade said the first reaction of the police should have been to clear the road and later decide on territorial jurisdictions. The first reaction should have been to call in a crane and tow away the buses to a place where traffic movement was not affected. The accident took place on the intersection of the road around 7: 30 a.m. The school bus was moving southwards on the road dividing Sectors 20 and 30. 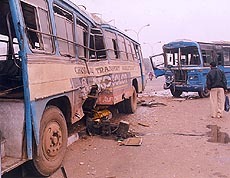 A CTU bus coming from Sector 20 was crossing the dividing road to enter Sector 30. The school bus hit the middle portion of the CTU sending it off the road. The CTU bus climbed onto the road divider and smashed the traffic lights. Meanwhile the blue colour school bus blocked traffic moving southwards on the road dividing Sectors 20 and 30. The entire road stretch is under the Sector 19 police station. 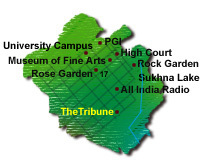 Prominent roads, for example Dakshin Marg, have been divided under the jurisdiction of various police stations. The demarcation is done on the basis of the road dividers. Same is the case for the busy Madhya Marg. The strike call had been given by the the United Forum of Bank Unions, which represents unions of officers and lower staff. An impressive rally was held near the zonal office of the SBI in Sector 17 here. Members raised slogans against the Indian Banks' Association (IBA) for non-implementation of wage policy . Leaders claimed that no business was transacted at 24 nationalised banks and their 250 branches. Work was also hit at 20 private and co-operative sector branches but here too cheques were not cleared. Addressing the rally, leaders said the IBA was adopting dilly-dallying tactics on the wage revision settlement which was overdue  since November 1997. They said today's nationwide strike was the first step towards a long-drawn battle in case their demands were not met. They said the offer of an 8 per cent increase in wages was not acceptable to them as it included superannuation benefits, PF, gratuity and pension which would reduce the carry home salary. "The banking sector employees were being discriminated against while the Central government employees recently got a substantial pay hike". Employee leaders also expressed their solidarity with the agitators and said their demands were genuine and that they would take part in further agitations. The protesters resolved that if their demands were not met they would have no option but to go on an indefinite strike. A meeting will be held on January 15 in Calcutta, to formulate the future course of action. The Associate Banks' officers' Association, comprising 400 members of the Bank of Patiala from Chandigarh, Panchkula, Ropar, Ambala and Solan, held a strike in front of their zonal office in Sector 8 here today, according to a statement by a union spokesperson. CHANDIGARH, Jan 12  The second phase of the Competition Master library related competitions 98 will be held from January 14 onwards. The remaining three competitions will be held at different venues in the city. The reference hunting and best reader inter-school and inter-college contest scheduled for January 14 will be held at the State Library in Sector 34. The students have been divided into four categories according to their classes. While students up to Class V will form the first category, classes VI, VII and VIII will be the second category, classes IX to XII and the college classes will form the third and fourth categories, respectively. The contestants in the reference- hunting competition will be given a passage. They would be required to locate the passage in the encyclopaedia and then take down the volume number, part number and page number of the passage. In another contest under this category, students will be given the title and author of a book which they will be required to locate in the shelves after consulting the catalogue. The best reader will be chosen after the participants are quizzed on the books they have read, a list of which has already been made available to the organisers. They will also be required to write a paragraph on the book they have recently read. The second contest in the second half of the series will be an inter- college quiz which will be held on January 16 at Government College, Sector 46, while the last contest, the inter-college debate, will be held in Government College, Sector 11, on January 18. CHANDIGARH, Jan 12  Ms Vani Gopal Sharma, Civil Judge (Junior division), today issued notice to the Chandigarh Administration for January 16 on a public interest litigation filed by Mr Pankaj Chandgothia, a lawyer, praying for a directive to the authorities to build Governor's Palace. The petitioner stated that Governor's Palace formed part of the trilogy of the Capitol complex and, if constructed, would give practical shape to the vision of Le Corbusier. All renowned experts who attended the international conference on Chandigarh had advocated the construction of the planned building. He stated that of the three temples of democracy only two  the Court of Justice and the Assembly  had been completed but the third  the Governor's Palace  had not been built. He, therefore, pleaded for building the same as it would provide the missing link of the Capitol complex as visualised by Corbusier. CHANDIGARH, Jan 12  Students of Government College for Men, Sector 11, today went on strike in protest against the arrest of the president of the college union, Amrit Pal Singh Brar, last night. The police arrested Brar, who has been suspended from the college following a complaint made by the hostel warden. He had reportedly threatened the warden last month. In addition to organising various activities such as a general awareness competition and games for children, a fete and a 'barakhana' was organised in which officials of the force and their families participated. Addressing the jawans Mr Ramesh Chandra, the Commandant of the battalion, exhorted them to enhance their professional competence and dedicate themselves to the service of the nation. Different versions of the events have been published in the media. In order to bring out the truth and go into the genesis of the problem, it was necessary to have an in-depth and an-on-the-spot study, a statement of the institute said. The five-member team will be headed by the institute chairman, Mr Shyam Khosla. The other members will be Mr K.S. Arya, Mr B.L. Gupta, Mr Rakesh Sinha and Mr N.K. Trikha. The employees handling an average monthly cash above Rs 25 lakh will be paid Rs 300 a month and those handling between Rs 10 lakh and Rs 25 lakh, Rs 250 a month. Similar slabs have been fixed for other categories of employees handling different quantities of cash every month. Sajjan Kumar from GCM was adjudged the best speaker. Padmini from GCG, Sector 11, and Gunnidhi Sharma from the Department of Sanskrit, Panjab University, came second and third, respectively. CHANDIGARH, Jan 12  The Mayor, Mr Kewal Krishan Addiwal, inaugurated an "apni mandi" at Dhanas today. With the start of the "apni mandi" the long-standing demand of residents of the area has been met. A former Mayor, Mrs Kamla Sharma, and a former Deputy Mayor, Mrs Harjinder Kaur, were among others present on the occasion. Meanwhile, Mr Mohinder Singh, Chairman of the apni mandi committee of the Municipal Corporation of Chandigarh (MCC), said he would protest in writing against the inauguration of the mandi. He alleged the proposal to open the mandi in Dhanas was never brought before the committee. Corporation timings: For the smooth functioning of the MCC, Mr Addiwal has fixed new timings for meeting him in the office. While the general public could meet him from 3 p.m. to 4 p.m., the councillors could meet him between 4 p.m. and 5 p.m.
Meeting postponed: The BJP-SAD alliance in the MCC has resented the postponement of the meeting of the finance and contract committee to Wednesday. A member of the alliance and a member of the committee alleged the members were not informed about the postponement. CHANDIGARH, Jan 12  Panjab University has recommended 100 per cent hike in examination fee for vocational subjects at the undergraduate level. Students will have to pay Rs 200 instead of the existing rates of Rs 100. This will be in addition to Rs 50 for each practical. In the science group students will have to pay Rs 250 as against the existing charges of Rs 130. Students of in this group will also have to pay Rs 50 for each practical. A final decision with regard to approval of the proposed rates will be taken by the special committee on vocational courses. Certain members of the revision committee had recommended that no fee should be charged from the students who opt for vocational courses for encouraging them to take " job- oriented courses".However,in view of the fact that the university had to make extra arrangements for these examinations, the hike was allowed. The Registrar pointed out that most students who apply for foreign universities for higher studies require the transcript of various examinations to be submitted to these universities. A single such transcript costs Rs 900 which is a " very costly affair". A student who applies for more than one university has to spend a considerable amount in preparing transcripts. It has been decided that a small sub-committee should be constituted to consider the issue and recommend a much economical package. The observers appointed for conduct, processing and evaluation processes will now be paid Rs 120 per session.The current remuneration is Rs 75 per session. Members of the flying squad will be paid Rs 90 per session instead of Rs 60. The new rates for paper setting and model papers setting is Rs 275 for the postgraduate courses ; Rs 275 for bachelor level courses; Rs 225 for pass course undergraduate courses; and Rs 200 for certificate courses. CHANDIGARH, Jan 12  A driver of the Fire department, Subhash Chand, died under mysterious circumstances at his one-room official apartment located on the Mani Majra fire station premises here this afternoon. Subhash (35), was living alone. He had gone to his house to cook some food for himself. He closed the door and reportedly dozed off. The quilt that he covered himself with reportedly caught fire from a heater kept inside the room. The legs of the deceased and the face have been burnt. He died on the spot. Even as fellow firemen rushed to his house, Subhash had died. According to police sources, he might have even been electrocuted. The police also found a half-consumed bottle of liquor lying near his bed. Car thieving bid: Two youths tried to steal a car driven by a woman in Sector 11 market on Tuesday morning. The woman, Ms Shruti Shaukeen, was driving her car and she stopped in Sector 11 for some work. Two youths tried to take the car away from her. However, the woman raised the alarm that deterred the two. They however, escaped. The police has registered a case under sections 511 and 382, IPC. Booked: A Sector 27 resident, Mr Joginder Singh, has been booked by the police for allegedly trespassing into the house of an old lady. He had allegedly forcibly occupied the house of Mrs Vidyawati, an old woman. The woman obtained an eviction order from the court. However, Mr Joginder still refused to vacate. The old woman approached the police which has booked him. Two VCRs stolen: Two VCRs and a sum of Rs 20,000 have been stolen as thieves struck at two different places in the city. Two VCRs were stolen from the Sector 35 shop of Mr Harmohan Singh. A Case under Section 380 of the IPC has been registered. A Sector 23 house was burgled on Monday night. Thieves took away a sum of Rs 20,000 besides other household articles. Admitted to PGI: A watchman, Rewal Singh, employed in a office in Sector 17 has been admitted to the PGI after he reportedly inhaled carbon monoxide emitting from an "angeethi". He became unconscious. Three held: The police has arrested three persons  Harish, a resident of Sector 15, Sushil, a resident of Mani Majra; and Vicky, a resident of Rajpura  for allegedly gambling at a public place. A case under the Gambling Act has been registered against them. A police official said Rs 375 had been recovered from the gamblers. Car theft: Mr Brij Narain Sharma, a resident of Sector 7, has complained that a car stereo, tool box and jack were stolen from his car parked in the front of his house on Sunday night. Accident: A cyclist, Balwant Singh, was injured after he was hit by a Maruti car near Sector 7 here on Monday. A case under sections 279 and 337 of the IPC has been registered against the car driver. CHANDIGARH, Jan 12  Mr Justice V.K. Jhanji of the Punjab and Haryana High Court today upheld the election of Mr Jagjit Singh, Congress candidate from Kartarpur (SC) Assembly constituency of the Punjab Vidhan Sabha, held on February 7, 1997. His election was challenged by Mr Ram Lal Jassi a rival candidate. Mr Jassi had lost to Mr Jagjit Singh by a slender margin of 278 votes. Mr Jassi had said that irregularities and illegalities had been committed by the counting staff by which his election result had been materially effected. It was alleged that a large number of votes polled in favour of the petitioner were counted in favour of the returned candidate and even votes liable to be rejected were counted in favour of the winning candidate. The Judge held that the averments made in Paras 7 to 11 which relate to alleged illegalities and irregularities committed during the course of counting were totally vague. As regards allegations of illegal rejection and improper counting of votes, the Judge held that the petitioner had failed to disclose material facts. It was thus, held that no triable issue remained to be considered. Thus, deciding the preliminary issues raised on behalf of the returned candidate, the Judge dismissed the election petition.